Guy Ramsbotham came for a visit. He did a lot of driving around with Tony. On one of their trips back to Mussoorie, they were winding their way through the Shivalik hills and were hit by a truck. It missed the jeep’s chassis by an inch. They went swerving towards the edge of the mountain but were stopped by a small concrete wall. It was one of the few places where there was any kind of barrier. Tony’s chair broke off and the driver’s side was a right off. Guy was unharmed and Tony had some big cuts on his arm and upper back but nothing serious. They were happy to be alive. Tony told me he had been having thoughts about dying. After that accident he knew it wasn’t going to happen any time soon. It took a while to get our jeep back. It was driveable but there were some problems. 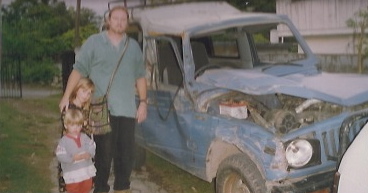 We drove around with a broken back seat, roof rack, choke and windows for a long time. A black garbage bag was taped to the back window to keep the cold out. It was so noisy with all the rattling, we could never hear what the kids were saying right behind us. We drove around shouting to each other at the top of our voices. We had written the letter we needed to write to Dudley and his team. He sent us a very gracious reply. Way more gracious than what our letter had been. Replies from others started coming slowly but regularly via snail mail and faxes. We also started getting some friendly phone calls. It was a relief to hear that more people would be coming to help us with ACTS. It was also good to know we didn’t have to do it alone. Jason and Ali arrived with little Michaela. They had come to stay. We had waited for that moment for a long time. They settled in quickly and were loved by everyone. It wasn’t really working with the young lady who had come to teach Ash and Zo. She was sweet but kept going “walkies” and didn’t seem to be able to focus on their schooling. It was difficult for her to settle into our life style. We realised again how important it was to talk about expectations right from the beginning; for both sides to spell them out very clearly. It was our experience that even though expectations were talked about, they tended to change over time. That was fine, as long as the changes were talked about. Talking was important. Things didn’t work if there was no talk. Tony brought copies of his CD “Off the Edge” back with him from South Africa. On his way through Dubai, he realised we didn’t have anything to play the CD on. He arrived home with a portable CD and cassette player. We were excited to have music in the house again. It had been a full year. There was not a dull moment. No day was like another. We were kept busy from morning ‘til night with the community, trainees, family and our many visitors. There was always someone needing a listening ear or a loving kick in the pants. There were many relational issues and we spent hours encouraging people to forgive, talk, confront, let things go, give things up, move on and grow up. They did. So did we. We all knew that if we didn’t, we weren’t going to go anywhere, or fulfil the purposes God had for us; and there was no way any of us wanted that.